Central bankers could intervene soon as US dollar index rises sharply. It was a roller coaster day in stock market on a day of full disappointing news. First US GDP came at 1.9%, followed by ECB Draghi questioning the sustainability of Euro and then IMF declining that Spain has asked for any aid. This week we heard rumor of ECB helping Spain, then ECB declined the rumor, then it was about China easing with 2 trillion yuan, which was again denied and the latest was IMF helping Spain. We know the saying of wall street, "Buy the rumor and sell the news". But this is the age of super computer and a retail investor has no such advantage. Dow dropped 100 point and S&P500 dropped 10 point in last 20 minute. Thats why I say, don't invest without stop loss or if your aren't going to watch this market. 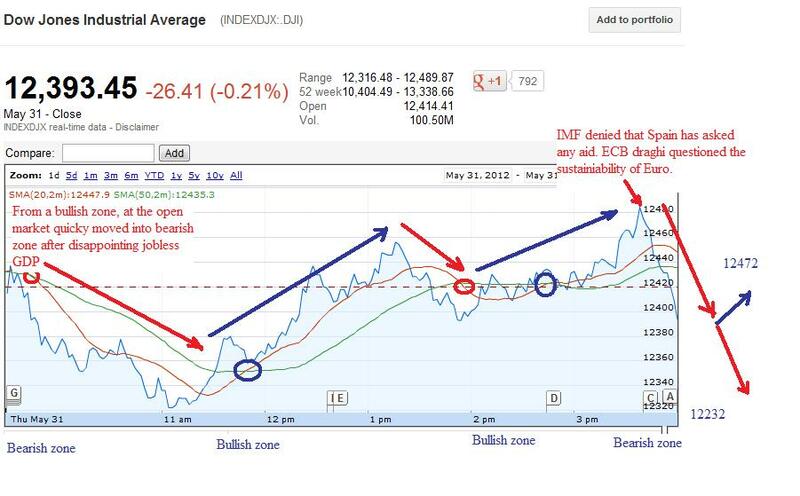 This market is not safe till Greece results are out by June 18th. So ECB is not ready to help, China has given up, IMF is out of picture, so everyone is now looking forward to Fed fomc meeting. Also the chance of global Central bankers of Europe, Japan, US and Canada could intervene if US dollar index keep rising like they did in November 2011. Dow and S&P500 closed in the bearish zone, and tomorrow key breakpoint in Dow for upside is 12472 while for downside, its 12232. For S&P500, 1318 is important key breakpoint for upside, while 1298 is key breakpoint for downside. Remember, 12225 is the most important breakpoint in Dow while 1275 in S&p500, if it breaks, then only Fed can save this market. Bulls would like to see weakness in US dollar index and rising Euro while Bears would like to see rising VIX and US dollar index. Don't get emotional and think this market has bottomed, US dollar index needs to come below 83, and ideally below 80. Moody is yet to downgrade 19 banks. So becareful. 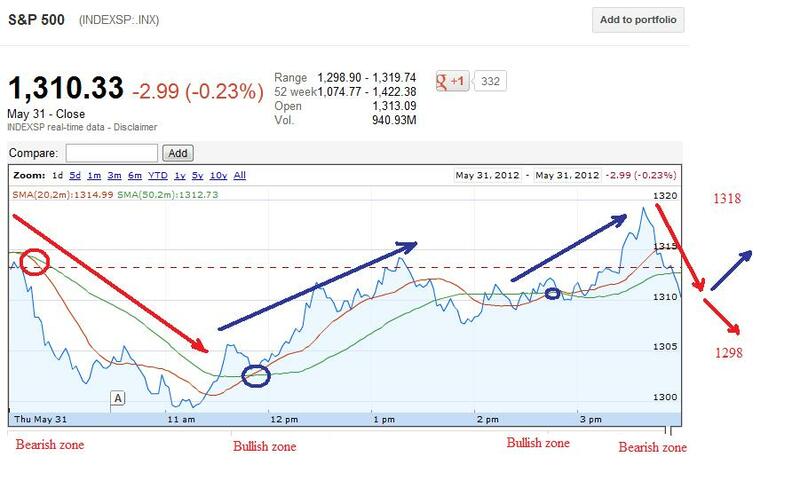 In a normal market, we could see selloff. I'll be watching calls in POT, HAL, CAT, XOM, ERX, TNA, PCLN and QQQ. Non Farm Payroll 8:30 AM ET (150k is expected, prev month was 115k; higher is bullish sign lower will be bearish sign for stock market). Below 75k will be bearish and market could sell off badly, above 150k will be bullish sign and market could rally sharply. Construction Spending 10.00 AM ET (0.4 is expected, prev month was 0.1; higher is bullish sign lower will be bearish sign for stock market). ISM Mfg 10:00 AM ET (54 is expected, prev month was 54.4; higher is bullish sign lower will be bearish sign for stock market).